Nobody looks forward to the inevitable accidents which occur in a bustling home full of active, thriving people. Accidents can happen anywhere and are common in households with lively and adventurous family members. With accidents looming in every corner of one’s home and yard, it is essential to ensure that families have a first aid kit that can be used to stabilize any injury. To address the need for a reliable, affordable, and convenient home first aid pack, Surviveware created their Expanded First Aid Kit. This kit is tailored to fit the safety needs of households who are likely to experience various accidents. The Surviveware Large First Aid Kit holds 200 life-saving essentials that are useful for treating any home injury. It contains several types of adhesives, bandages, gauze swabs, steri-strips, cleansing wipes, and non-adhesive dressings. The kit also includes hydrogel, splinter probes, a whistle, nitrile gloves, safety pins, cold packs, tweezers, and an emergency blanket. Surviveware also packed in fever strips and sting relief wipes. The company went further in improving the coverage of this first aid pack by including a CPR pack and an advanced first aid handbook. A separate mini kit is also included. This mini pack holds enough essentials for a day or weekend excursion, so that kit owners don’t need to remove provisions from the expanded pack to fill-in the mini kit when they want to travel lightly. These provisions are stored in a 10” x 7.25” x 5” 600D polyester bag. This polyester case protects the kit from dust, dirt, and other foreign materials. Since the case is made from durable fabric material, it can withstand normal wear and tear. Unlike plastic cases, the kit won’t break from falling or crack under pressure. This expanded first aid kit has MOLLE-compatible straps and a snap that can be used for securing the kit on rucksacks, tents, hammocks, and other nooks. It also has Velcro straps that can be used to keep it secured in one’s trunk. To ensure that the supplies remain fresh and clean, the company placed each supply in resealable laminate pouches. These packs preserve the provisions and ensure that no water or dirt can penetrate the items. There are extra plastic bags so users can store their prescriptions in organized bags. Surviveware is known for their kit’s organized and labeled compartments. This feature is present in their Large First Aid Kit. The company made sure that the supplies can be easily located through their labeled partitions. The piping of each section is marked with the name of the provisions and its appropriate uses. The labels every user locate where the life-saving medical supplies are stored. Since the items are kept in compartments, there is ample space for additional survival tools such as multipurpose tools, fire starters, additional emergency blankets, Israeli bandages, and prescription medication. 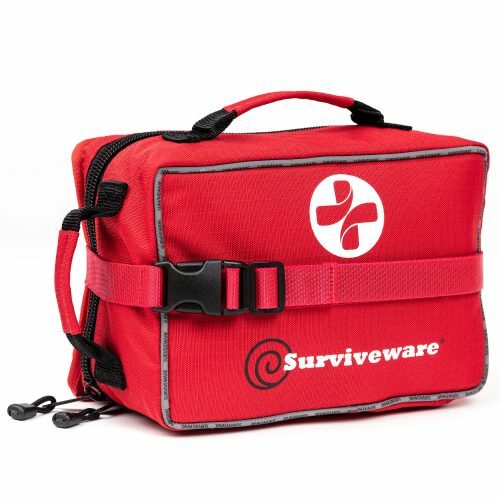 The Surviveware’s Large First Aid Kit is FSA- eligible and can be purchased using one’s funds. Grab this first aid kit today and secure your family’s safety. Order this kit today and enjoy it at a 20% discount by using our Amazon discount coupon. This is a limited time offer so get yours now today by clicking here!